It is unclear whether Maurer hoped to sell any of the four paintings he lent to the Armory Show. The catalogues annotated by the exhibition co-organizers Walt Kuhn and Elmer MacRae do not list asking prices for any of Maurer’s works, suggesting they were not for sale. He also produced Fauve still lifes and figure studies. See Stacey Beth Epstein, “Alfred H. Maurer: Aestheticism to Modernism, 1897-1916” (Ph.D. diss., CUNY Graduate Center, 2003), 205. Maurer painted chiefly in three towns along the Marne: Chezy-sur-Marne, Chateau Thierry, and Chalons-sur-Marne. This set him apart from his Fauve colleagues, who preferred to paint sites on the Norman coast. Charles H. Caffin, “The Maurers and the Marins at the Photo-Secession Gallery,” Camera Work 27 (July 1909), 41. “The First American Post-Impressionist,” New York Evening Globe, January 22, 1913. “Post-Impressionist Shows Work Here,” The Sun (New York), January 18, 1913, 6. Maurer was one of the few Americans to exhibit paintings inspired by European modernism in the United States before the Armory Show. Alfred Stieglitz showed his Fauvist work twice at 291 gallery: in a two-person exhibition with John Marin in 1909, and in a 1910 group show of works by young American painters. In 1912 the Armory Show co-organizers Arthur B. Davies, Walt Kuhn, and Walter Pach approached him for help in planning the exhibition; Kuhn later recalled that Maurer introduced him to Vollard in Paris. 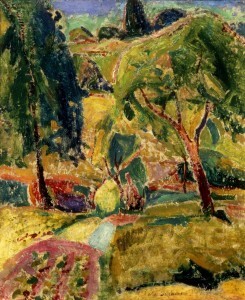 Maurer also lent four of his own paintings to the exhibition. Sheldon Reich, Alfred H. Maurer, 1868-1932 (Washington D.C.: Smithsonian Institution Press, 1973), 22-25. Gertrude Stein, The Autobiography of Alice B. Toklas, 10, quoted in William H. Gerdts, The Color of Modernism: The American Fauves (New York: Hollis Taggart Galleries, 1997), 23. Stacey Beth Epstein, “Alfred H. Maurer: Aestheticism to Modernism, 1897-1916” (Ph.D. diss., CUNY Graduate Center, 2003), 176. Ibid., 86. Elizabeth McCausland described his transition to modernism as sudden, but scholars now dispute that: both Reich and Epstein see the transition as more gradual. Walt Kuhn, The Story of the Armory Show (New York: Walt Kuhn, 1938), 10.